For nearly 40 years C. Michael Cowett ably provided legal guidance and counsel to public agencies responsible for essential water, sewer and transportation services to this region. He played a role in virtually every water issue affecting the Greater San Diego area since the 1970’s. He was responsible for mentoring and fostering the careers of many young lawyers. Mr. Cowett loved the community and worked on projects and committees intended to make it a better place for all its residents. He assisted in the development of “Del Mar 2000,” a planning document for Del Mar’s Village Center. He was an advocate and organizer for the development of a new Civic Center/Community Center in the late 1980’s/early 1990’s. Mr. Cowett also served and chaired the City Council appointed Citizens’ Committees to review the Del Mar’s water and sewer rates and structure. In 2005 he was named one of San Diego’s top municipal/government attorneys by The Daily Transcript, and in 2006 The Daily Transcript chose him as one of San Diego’s “Top 120 Influentials,“ an honor reserved for pioneers who played an integral part in the growth of San Diego. Mr. Cowett loved the legal profession and combined his community service with efforts that kept him close to the law. He was a member of Lawyers Club, and understood the importance of advancing women in the legal profession. He was at the forefront of developing life balance-based policies at both Jennings, Engstrand & Henrikson where he began his career and at Best Best & Krieger where he ended it. He took to heart the importance of law firms helping lawyers find balance and the need for policies that allowed attorneys to raise families, assist with aging parents, deal with life’s challenges, and to be active participants in the communities where they lived. 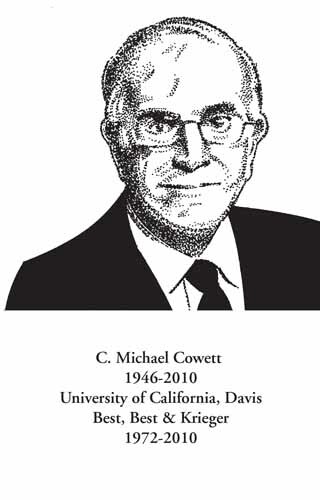 If it is true that many people attend law school for the purpose of making contributions to our society, culture and government, then those who knew Mr. Cowett knew that he strived to do that on a daily basis. He made these contributions not only through the legal services he provided, but also by mentoring and supporting new attorneys, legal professionals, and the officers and employees of the public agencies he served.